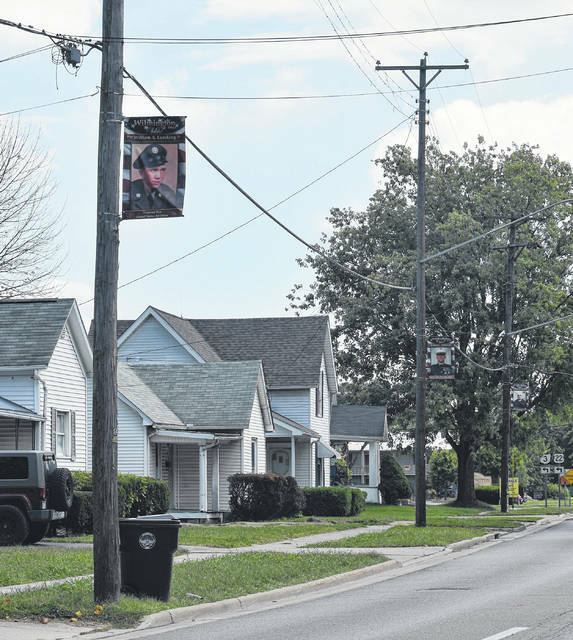 Military banners hang on Fife Avenue. The military banner for J.W. Denver Williams Jr., who was killed in action on Okinawa in World War II. WILMINGTON — The military banners have arrived and are being proudly displayed. The Wilmington Military Banner Program has been initiated to continue our community’s legacy of supporting and honoring our military service members. While 40 are currently on display in Wilmington — many on East Main Street and on Fife Avenue — there are still over 70 that have yet to be hung, according to Jen Woodland. Woodland told the News Journal the process of making a banner is a slow one — applicants or their families want to find their favorite photo to use and make sure they have all the details correct. Nevertheless, she is happy with how things have gone since the project started. “I am very pleased with the results,” she said. She wants to emphasize that this program is not solely for Clinton County residents. Among those honored with a banner is Jack Rose, a Sergeant in the Army’s 7/17 Air Calvary in the Vietnam War. In front of Wilmington College is the banner for Paul Schwamberger, who was a Private 1st Class in the Army during World War II. Schwamberger’s daughter, Patti Davis, who submitted the application along with her mother and her sisters, was thrilled to see it. “Going down the road there’s dad in front of the college where he went to school. It was so thrilling I wanted to cry,” said Davis. Woodland wants people to know there is no deadline to apply, and she plans on dedicating the next few years to honoring the veterans. “I want to see every street, alley, country road and parking lot with banners,” she said. For a cost of $210, individuals, families, and/or businesses can sponsor a banner for a service member. 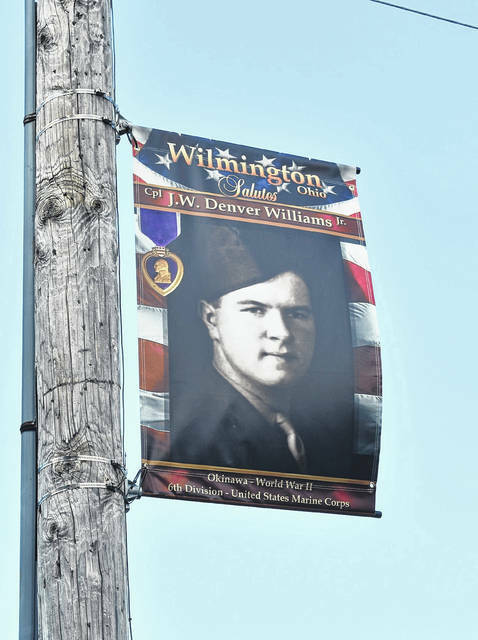 The banners measure 30 inches by 48 inches and will be flown from utility poles throughout Wilmington during the period between Memorial Day and Veterans Day. The banners can honor both active service members and veterans who served in the past. Contributions in any amount are also being accepted to be used to purchase banners for those service members or veterans who cannot afford a sponsorship. To obtain additional information and to see an example of a banner, please visit www.troopbanners.com/Wilmington. Applications for sponsorship can be downloaded from the website. The application, a picture of the service member in uniform, and a check made out to Clinton County Foundation c/o H.O.M.E. (Honor Our Military Everyday) and mailed to Jennifer Woodland, 862 Fife Ave., Wilmington, OH 45177.
https://www.wnewsj.com/wp-content/uploads/sites/22/2018/08/web1_DSC_0364.jpgMilitary banners hang on Fife Avenue. https://www.wnewsj.com/wp-content/uploads/sites/22/2018/08/web1_DSC_0369.jpgThe military banner for J.W. Denver Williams Jr., who was killed in action on Okinawa in World War II.